Danie Gerber was a player of immense talent whose career was stunted by South Africa's apartheid. Gerber reached the peak of his powers in the 1980s, when the despised apartheid regime meant that South Africa's Springboks were in international isolation. A centre with the rare mix of speed, size and agility, Gerber was a devastating attacker and a rock solid presence in defence. His ability to step off both feet and break tackles with a remarkable regularity meant that a sense of excitement fell over crowds once the ball made its way into his grasp. Gerber's first cap came in 1980 against the touring South American Jaguars, but he would record only 24 caps before his retirement from rugby in 1992. Perhaps his finest hour came against England in 1984, when playing outside South Africa's first ever black player Errol Tobias. Gerber scored a hat-trick in 18 first half minutes as the Springboks dismantled England in a then record 35-9 win at Ellis Park. In contrast to his lack of exposure at international level, Gerber was a fixture of the South African club game. He played 115 games for Eastern Province, 40 for Western Province and 24 for Free State during his career. Whatever colour the jersey on his back, Gerber was a passionate and committed player. He set new standards for fitness and athleticism within the amateur game, adhering to a punishing regime of swimming, circuit training, weightlifting and long distance running. Gerber's talents were seen on the fields of Europe for the first time in 1983, when he accepted an invitation from the Barbarians to turn out against Scotland. Following the 1984 series with England, South Africa were placed into isolation. Gerber was unable to showcase his talents against world-class opposition, although he did put in scintillating performances against the rebel New Zealand Cavaliers touring side in 1986. Gerber had previously been linked with a move to the professional ranks of British rugby league, a path trodden by fellow Springboks Ray Mordt and Rob Louw. Under the tutelage of Springbok coach Danie Craven, Gerber saw professionalism as sacrilege and turned down all big money offers that came his way. 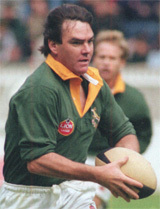 Gerber shone on South Africa's reinstatement to international sport, with a brace in their first Test back against the All Blacks in August 1992. He was not finished there however, with try-scoring performances in both away Tests to France later that year. Gerber called time on his career following South Africa's loss to England at Twickenham in November 1992. He was 34. Gerber's legacy will always be one of disappointment for many rugby fans, as South Africa's politics deprived the international game of one of its brightest stars. No centre had combined the athleticism and power that Gerber possessed before, and while the spectre of the quick, powerful centre now looms large over world rugby he has yet to be bettered. His strike-rate of 19 tries in 24 Tests is exceptional, and Gerber was a player for whom no defence was watertight and no opportunity to score was turned down. While other players may have vastly more test caps to their name, few possessed the power, pace and swagger of Danie Gerber.